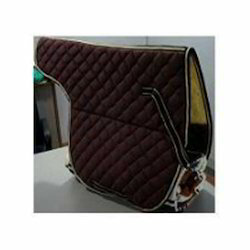 Leading Manufacturer of saddle cloth pad, dressage saddle cloth pad, purpose saddle pad, velvet saddle pad, numnah pad and horse saddle pad from Kanpur. 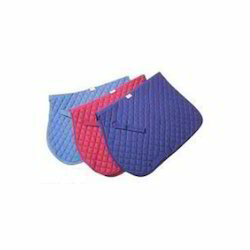 Being the leaders in the market, we are engaged in offering Saddle Cloth Pad. This saddle cloth is fabricated by our experienced designers using the best grade fabrics and modernized technology. With the excellent design, our saddle cloth has smooth texture and avoids any irritation to horse body. Furthermore, our saddle cloth is globally appreciated and demanded by our clients for its uniqueness. Moreover, client can avail this saddle cloth from us at market leading prices. With our years of experience and knowledge, we are engaged in offering a superior quality Dressage Saddle Cloth Pad. Keeping in mind the diverse requirements of our clients, we provide this saddle cloth in different colours and designs. In order to ensure quality, our offered saddle cloth is stringently checked on various parameters by our quality controllers. Apart from this, our saddle cloth is beautifully designed using remarkable quality fabric and is made available at highly competitive prices. With the help of our skilled designer, we are capable in offering a supreme quality Purpose Saddle Pad to our precious clients. This saddle pad is available in various distinct designs and attractive colourful combinations according to specifications of clients. Our offered pad is examined under the supervision of our quality controllers with set industrial standards. 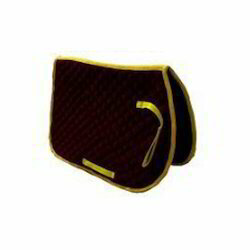 Furthermore, client can avail this saddle pad from us at least market leading prices. With our consistent focus on globally fashion trend, we proudly introduce unmatched quality Velvet Saddle Pad to our esteemed clients. 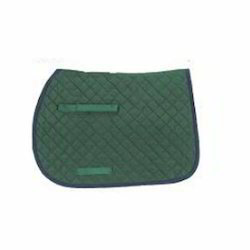 Our offered saddle pad is widely demanded for its brilliant features such as attractive colours, optimum quality etc. 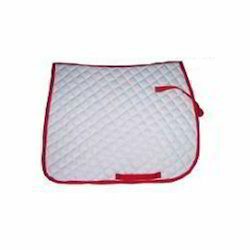 This saddle pad is precisely designed by employing high quality fabric and latest fabrication technology. In order to ensure a defect free supply at clients' end, the offered saddle pad is checked by our quality analysts on well-defined parameters of the industry. Focusing on the international fashion spectrum, we bring forth a stylish and designer Velvet Saddle Pad. 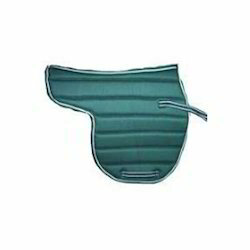 The saddle pad designed by us is suitable for covering horse back and provides safe ride to the riders. 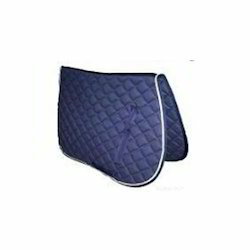 The offered saddle pad is designed by our designers using quality proved fabrics which assure its softness. Our saddle pad is appreciated for its unique patterns, splendid designs, perfect finish etc. 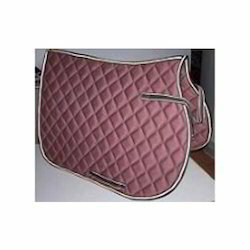 Further, clients can purchase this saddle pad from us at rock bottom prices. With the help of our skilled designer, we are capable in offering a wide array of Numnah Pad to our reliable clients. This pad is available in diverse designs, colours and sizes, these pads are extensively used to cover the back of horses to ensure comfortable ride for riders. Our offered pad is examined under the supervision of our quality controllers with set industrial standards. Furthermore, client can avail this pad from us at least market leading prices. With our consistent focus on globally fashion trend, we proudly introduce a wide assortment of Cotton Saddle Cloth to our esteemed clients. Our offered pad is widely demanded for its brilliant features such as attractive colours, optimum quality etc. Skin friendly in quality, our saddle pads are made by utilizing excellent quality of materials and fabric. In order to ensure a defect free supply at clients' end, the offered pad is checked by our quality analysts on well-defined parameters of the industry.